April 1, 2014 - The New York Mets opened the 2014 season at home with a 10 inning loss to the Washington Nationals, 9-7, despite a stellar performance by starting pitcher Dillon Gee. 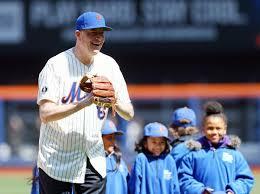 New York City Mayor Bill de Blasio, donning a white Mets jersey and blue cap, threw out the ceremonial first pitch on a chilly day at Citi Field. The first-year Mayor, who tossed a strike to Mets catcher Travis d'Arnaud, was accompanied by six children from the East Harlem Tutorial Program who were affected by the recent building collapse in that community. The Mets also honored longtime Mets broadcaster Ralph Kiner during a pregame ceremony which included the unveiling of a commemorative logo that will hang on the left field wall. The team will also wear a special patch on their uniform in his memory. Kiner's four children were in attendance, including his eldest son Michael, who reminisced about his days with his father at the ballpark..
“Whenever we went to games, we’d go to the park early and watch the directors and producers produce the game,” Michael said. “There were the old cue cards, before they had prompters. Being a kid, we used to idolize the players, and my dad would always give the players watches and $100 certificates on ‘Kiner’s Korner’." On a personal note, I was invited to the Nationals broadcast booth where I was greeted by longtime ASA member and Nationals play-by-play voice Bob Carpenter, along with his partner F.P. Santangelo. Carpenter reiterated his interest in the ASA's efforts to help our returning veterans get training and subsequent jobs.